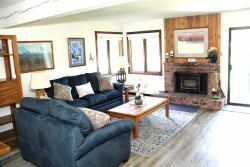 One Bedroom & One Bath Condominium in the Scenic Meadow Area of Mammoth Lakes. Sleeps up to 5 (approx. 800 Sq. Ft.). This spacious ground floor unit is all one level and there are no outside stairs to enter the unit. Corner unit is bright with lots of windows to let the light in and has a great view. The Master Bedroom has 1 Queen Bed and 1 Twin Roll-a-way Bed. The Living Room has one Queen Foldout Couch and Love Seat. There is 1 New 40" flat screen TV in the Living Room with a DVD player, Stereo/CD player. There is also 1 Flat Screen TV in the Bedroom with a DVD player. WIFI Internet Access in unit. Phone in unit 760-934-1422. There is one outside parking space available. Sunrise Condominiums offer a Spa, Seasonal Swimming Pool and Sauna. Coin-operated laundry facilities located in the common area near the office. COMPLIMENTARY INTERNET and CABLE TV are provided, however NO REFUNDS will be given for connectivity problems or Internet failure. TOT LICENSE 807-SR06. We had a great time in Mammoth. The condo was very comfortable. As always we enjoyed our stay immensely, clean, cozy and friendly. I love unit 6-. good for gazing at the Sherwins. 10 out of 10. Great spot! Would stay again! We had a fabulous time at Mammoth! Our place was warm, cozy and perfect for our needs. Would definitely go back! Thank you. We come up to Mammoth just about every year for a week around Memorial Day because we love Mule Days, the unpredictable weather and our son and daughter-in-law live and work in Mammoth. We usually stay in SR #6, which we like because of its location, great view of the Sherwins, good WiFi (weve never had a problem with it, and my husband often does work related internet activities during our vacations (ugh! )), great pool and Jacuzzi. The unit is perfect for just two of us and is in a quiet location where we can walk into town easily. These are all good things. We really appreciate your flexibility! Well be back sometime in the summer/fall. Fully stocked small apartment that stays well heated. Would stay again. Thank you so much for letting us stay! The condo was warm and cozy, and in a great location. We had a fantastic time! The condo was warm and cozy, and could comfortably sleep 5 (queen, pull out couch, extra bed in closet). The kitchen was well equipped with everything we needed for eating in, but the condo is close enough to shops, restaurants, and the Village that it was easy to pop over there too. We had a car that we drove to the lifts, but it looks like there was a shuttle stop just around the corner for people who dont want to drive up the mountain. All in all, we had a great time and were really happy with the condo!! Beautiful scenic area. Very short drive to Eagle Lodge. Spacious and clean. Would definitely stay here again! Thank you! Love the cabin! Awesome place! Great location! Great condo and housing experience! We had everything we needed. Easy parking and good location to get to and from the slopes with car. Would definitely recommend this place! Easy and convinient! Clean place with everything we needed for a full week! Make sure the hot water doesnt run out that fast.. But it is a luxury problem and not really a major issue. We were just here for a quick ski trip. Kitchen had utensils and cookware which made meals convenient. Short 5-10min walk across the creek to a bus stop and bar. We have been staying at sunrise since the early 80s when our children were babies. this is the first time one of our children brought her baby. I cant think of any way you could improve. It is a perfect mammoth location and the room was comfortable and clean. hope to be back with a new generation at sunrise. We had a great stay, and thoroughly enjoyed the condo because of its proximity to town and the incredible view of the meadow and mountains. We especially enjoyed fishing and site seeing. Always wonderful being in Mammoth and at Sunrise 6.